The British Army has contracted QinetiQ to evaluate the options for active protection systems (APS) for use on British military vehicles. In the £7.6 million ($9.89 million) contract, QinetiQ is obligated to deliver a number of MUSS based systems for evaluation. These systems will be tested against different weapon systems and will also be tested as "applique integration" on the British Challenger 2 main battle tank (MBT) from BAE Systems. The "multifunctional self-protection system", MUSS, is a protection system developed by the Franco-German company Airbus (formerly EADS) in cooperation with the companies KMW and Buck (a subsidiary of Rheinmetall) on behalf of the German Army. The development started in 1995, but the APS was first adopted on the Puma IFV in 2015. MUSS is a soft-kill active protection system, which uses a jammer and multi-sprectral countermeasures to prevent air-launched and ground-launched guided weapons of hitting the vehicle. The APS has been tested on the Boxer MRAV and on the Leopard 2A5, but was only adopted on the Puma. Presentations from EADS mention a number of further vehicles onto which MUSS was proposed, mounted or tested. These include LAV, Pandur and the Leclerc, although on the latter only the warning sensors were mounted, not the active countermeasures. For detecting missiles, MUSS utilizes optical sensors and laser-warners. Originally the PMILDS missile warner, an improved version of the EADS-developed AN/AAR-60 missile warner used on many aircrafts including the F-16 "Fighting Faclon", the UH-60 "Black Hawk" and the Eurocopter Tiger, was used in combination with separate laser warners. EADS developed a system combining both missile and laser warner into a single package. Each of these sensors can cover about 95° in azimuth and elevation. 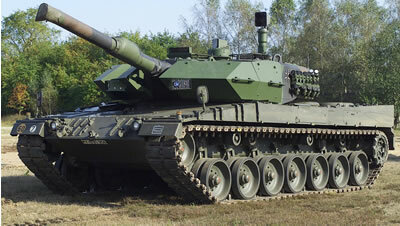 The version tested on the Leopard 2A5 tank used only two sensor units, which were covering only the frontal arc. On the Puma IFV however MUSS is equipped with four sensor units, which together provide a 360° coverage in azimuth. For deflecting the guided missiles, MUSS uses two components: a jammer and launched countermeasures. The rotatable jammer is aligned with the path of the missile by the computer system. It creates a modulated and focused IR beam to defeat SACLOS-type missiles. In 2002 it was estimated that more than 70% of all ATGMs could be jammed via such an IR beam. Following the detection of an ATGM, the system can automatically launch the active countermeasures. These are located in smoke grenade dischargers, which can be rotated into the direction of the missiles. Unlike conventional smoke grenades, the MUSS countermeasures create a cloud of multi-spectral smoke, that blocks IR, UV and laser beams. This is believed to be an effective way of disabling fire-and-forget missiles. On the Puma IFV, there are eight countermeasure ready to fire. A stand-alone version of the MUSS APS, called "MUSS 360° Compact System" by EADS, has been developed as drop-in solution for existing vehicles. This sounds a lot like the British press release speaking of the "applique integration" of the MUSS active protection system into the Challenger 2 MBT. Old presentations on the MUSS APS suggested the integration of radar panels and hard-kill countermeasure launchers into the system. At the time, this was the AWiSS protection system developed by Diehl Defence for the German Army. It is not known if this suggestion has ever been realized, the current version on the Puma IFV at least lacks any hard-kill components. The contract with QinetiQ is part of the MEDUSA Technical Assessment Programme of the British Defence Science and Technology Laboratory. This program can lead to a major boost in the protection of British vehicles and soldiers in combat, but one has to keep in mind that a research program doesn't have to lead to the adoption of such systems in the near future, specifically given the economic havoc caused by Cameron's Brexit referendum.